For those of us living in colder climates, fireplace season has officially arrived! If you are lucky enough to have a fireplace, you’ve probably already snuggled up to it more than once. If you don’t have one, perhaps it’s time to peruse the options before Old Man Winter really sets in. Adding a gas fireplace to an existing home is entirely possible. In addition to traditional hearth styles, Heatilator has several models that will fit into spaces you may not think possible. Some rooms lend themselves perfectly to a corner fireplace, especially when the square footage is smaller. Tucked neatly into a corner, a Heatilator corner gas fireplace serves as an anchor for the room, bringing all the same comfort and warmth of a traditional fireplace, but in a more compact space. No room for a bulky hearth? No problem. The Heatilator Novus Evolution gas fireplace can be installed flush with the wall and raised off the floor like the example below, or it can be placed at eye level similar to a piece of art. It is sleek and stylish, and you’ll have several options for front finishes and glass media colors. 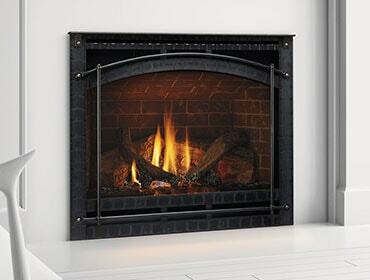 If you are looking for a fireplace that’s truly unique, the Heatilator Peninsula gas fireplace elegantly divides any space. This three-sided fireplace makes it possible to view the flames from all angles. The unconventional placement in the room makes the fireplace a major point of interest that cannot be denied! If your home has smaller square footage (or even if it doesn’t), you can in essence have two fireplaces in one by installing this single, compact see-through fireplace. It is two-sided, meaning the fireplace can be enjoyed from two rooms. In other words, the see-through viewing area makes the fire visible on both sides of a wall, doubling the ambiance and warmth. Each side of the fireplace can be designed differently too, so it really is like having two fireplaces in one! As you can see, there are many exciting new design options for Heatilator fireplaces. Without ever leaving your home, you can see for yourself how these fireplaces will look in your room! This Tool Will Change How You Design Your Home.